Union Public Service Commission (UPSC) had invited application 107 Posts of General Duty Medical Officer, 20 Posts of Medical Officers Gr.II, 05 Posts of Doctor (GDO) Gr. II in directorate health and family welfare services. UPSC is going to conduct combined computer based written examination on 1st February 2015. A lot of numbers of candidates had applied for these posts. The Latest News is that UPSC has released Admit Cards for these posts available on official website of UPSC. Those candidates who had applied for UPSC Exam 2015 and waiting for admit cards can get their admit cards from the direct link provided in the end of post. · Click on the check point to download Provisional Admit Card for UPSC Exam. 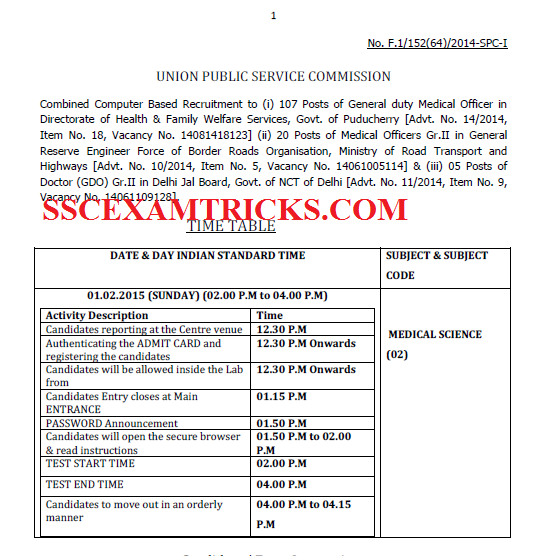 · Download UPSC Admit Card. The exam will be conducted on 1st February 2015. In Computer Based Written Test Mode, the exam will entertained through filling of circles on Computer by clicking circles on Computer. There is no OMR sheet will be filled by Blue/Black ball point pen.